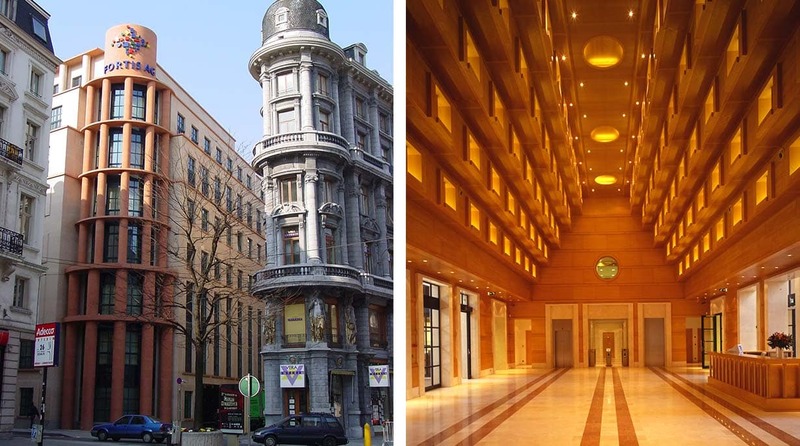 At a time when major corporations were relocating to the suburbs, Fortis AG committed to keep its headquarters in the historic core of Brussels. While the interiors would become a modern office, the massing, facades and public interiors responded to the traditional context while creating a fresh image for the company. MGA&D articulated the 112-foot long façade on Boulevard Emile Jacqmain as a series of pavilions to offset the large size of the building and relate it to pedestrian scale. A cylindrical tower at the corner of Rue St. Michel formally relates to an adjacent building and displays the company logo.